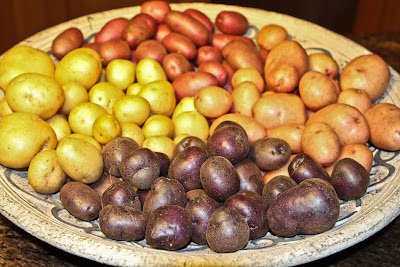 Well these are the potatoes I harvested on March 5th, 2011 from my prepper garden. I have dehydrated some and boiled others. Currently I have planted another 20 grow bags of seed potatoes. I put dried comfrey leaves and “energy pellets” in the holes and also Micorrhizae fungi for disease protection. I planted them with 6 inches of soil below them and 4-6 inches above them. I have only lightly watered them so they wouldn’t rot in a muddy mess. What Soil Mix Should I Use for Prepper Gardening? The soil in the grow bags has a lot of partially broken down pine straw and coconut coir mixed in. I have reused the soil from the previous grow bags. I know, I know, everywhere it’s says never to replant potatoes in the same place. 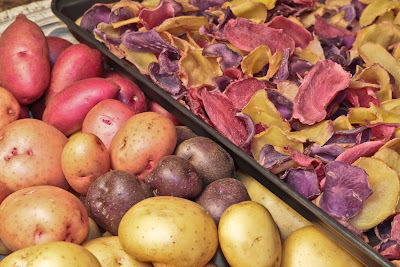 I had no disease issues with the previous potatoes, only a few fungus gnats. If I had to buy all new soil for the grow bags it would cost so much money I might as well just buy the potatoes from the store already grown! 30 bags of soil at about $6 will get you a whole bunch of taters. So, I’m reusing the soil. Over the summer, after this new batch is harvested, I’m thinking of planting a cover crop or”green manure” as it’s also commonly called in the garden world. This will add nutrients to the grow bag soil naturally. Clover, wheat or other cover crops are grown and then tilled or mixed into the soil before they flower and seed. I have used a grain mix outside in my raised beds between planting the next garden.